MAP has been working on the island of Phra Thong on the Andaman coast of Thailand since 2008. 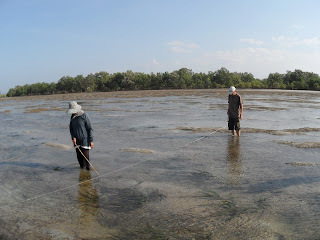 The island has diverse and abundant marine resources, including mangrove and seagrass. MAP has promoted their protection through sustainable management and the development of alternative livelihoods for local people. To that end, MAP has supported handicraft development, specifically the production of tie-dye cloth using natural dyes, and a home-stay program that earns income for village families from tourism. Local people remain dependent on small-scale fisheries, and they are very concerned about conserving them for future use. Two villages on the island have declared protected areas in their seagrass meadows, where removing organisms of any kind is prohibited. 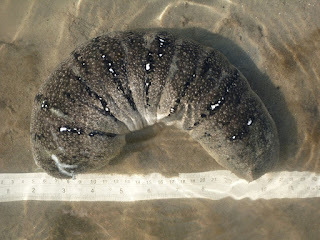 The meadows are an important habitat for fish, molluscs and crustaceans, as well as the endangered dugong. 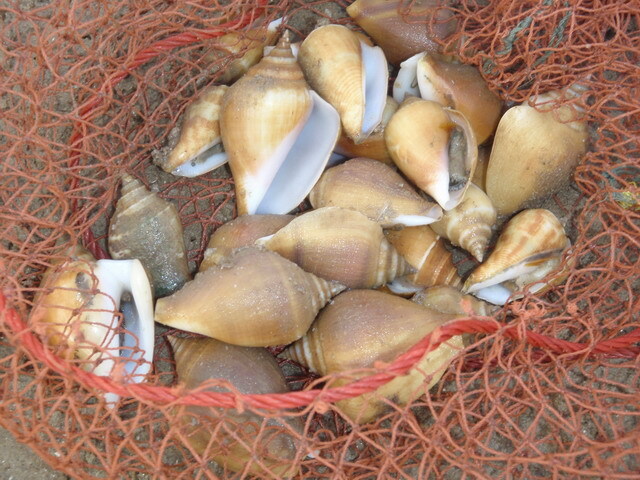 Villagers usually collect a variety of snails, clams, crabs and shrimp from the meadows at low tide, but the most important animals collected are the dog conch, Strombus canarium, and the sea cucumber, Holothuria scabra. MAP supported a successful application to Mangroves For the Future (MFF) for a small grant to manage and promote the protected areas and to monitor and evaluate outcomes of local management. Phra Thong will be an important model for local, small-scale conservation initiatives elsewhere. For over a year now, the number of conch, sea cucumber and other large invertebrates in the meadows have been monitored using line transects. Animals have been counted along 1 m bands either side of 50 m transects. The results show increased numbers of conch in one protected area, but no change in the other. Large, commercially valuable sea cucumbers are now appearing in one protected area, although the numbers remain low. Understanding why the results have differed between areas may provide important lessons for the successful protection of small conservation areas by other communities.